If a gallery contains a "Buy Photos" button, prints and other collectibles can be purchased from this gallery. If the images in a gallery don't have a "Buy Photos" button, the gallery is for some other purpose, like social media sharing, emailing, etc. 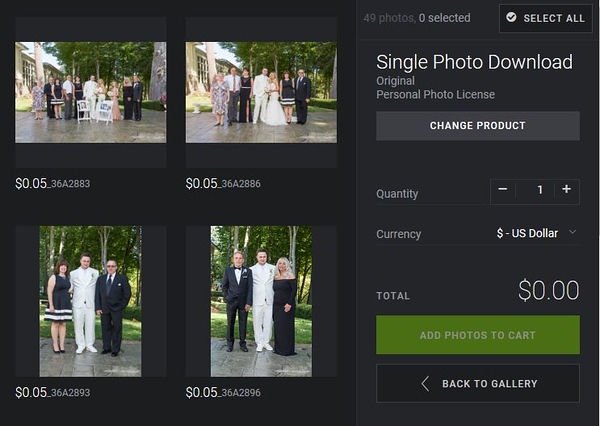 To add one photo to your cart at a time, click the "Buy Photos" button and select "This Photo" from the menu. To add multiple photos at a time, scroll down on the page for more information. 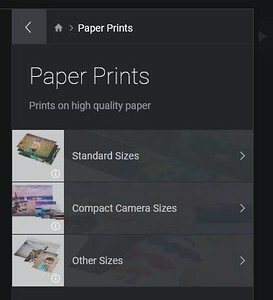 • Paper Prints: Get just the print without the fixin’s. Perfect for photo albums, scrapbooks, wallets, and more. • Wall Art: Includes vendor-specific specialties such as canvas, ThinWraps, Block Prints, Aluminium, and Metal Prints. • Desk Art: Includes vendor-specific options such as flat- and curved-metal prints. • Keepsakes: Includes mugs, buttons, and more. • Phone Cases: Get a personalized case for your phone. Includes cases for iPhone and Android phones. • Digital Downloads: Save a digital copy of a photo to your own hard drive for posterity or printing elsewhere. Once you’ve chosen which type of print you want, you’ll be guided through your options for making your print perfect! Note: Please don't click Add to Cart until you've looked at Step 2 below. Want to add several different photos at once? Click the "Buy Photos" button and select Photos from this Gallery. 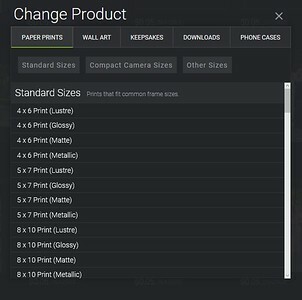 Click Change Product if you want to select a different print type for your photos. We give you lots of options to choose from to ensure the print you order will be one you love! Size: This is the trim size of your product, shown as width x height. Every standard size is available here, as well as sizes specially cropped for compact cameras. Compact digital cameras take 3x4 photos, which fit your TV perfectly but don't fit 4x6, 5x7, or 8x10 print sizes exactly. One solution is to buy 4x5.3 prints, which better fit the compact-camera aspect ratio. Crop: It can be a shock to discover your photo won't fit all print sizes without a bit of trimming. But at least you're empowered with your own knife. You can tell us what part of the photo to print, right in the shopping cart, by adjusting the crop lines. Find out how. The crop can be adjusted when selecting print sizes, finishes, or later in your shopping cart. A white outline displays the portion of the image that will be included. Move the crop area by click and dragging or click on the corners to resize. Finishes: Our most popular finish choice is lustre, which combines the color saturation of gloss with the fingerprint resistance of matte. But feel free to pick of the other finishes available for your print. Not all finishes will be available in every gallery. 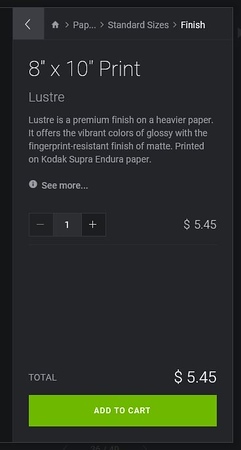 Lustre is a premium finish on a heavier paper. It offers the vibrant colors of glossy with the fingerprint resistance of matte. Glossy is a shiny finish and prints appear brighter than Matte. Matte is a more muted finish, and prints will appear darker than Glossy or Lustre. Metallic has a rich, distinctive look with a huge WOW factor. Once you’ve finished selecting all your photo options, click Add to Cart. Don’t forget to click this button; otherwise, your print(s) won’t appear in your cart when you’re ready to check out. Click View Cart if you're ready to finish your order, or click Close to keep browsing and shopping. 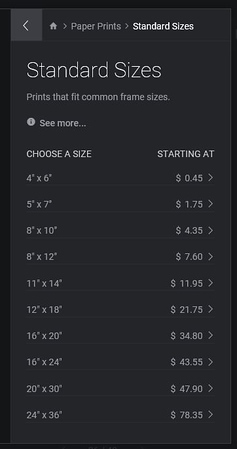 Once you’ve selected everything you want, either select the "View Cart" button or select "items in Cart" at the top right of the page to be taken to your cart. Here you’ll enter your shipping and billing information, as well as any coupons you may have from us at Shadow Cast. You can also make changes to your order—like if you decide you want two of everything or want to change your crops. If your photographer has framing and matting options enabled, you’ll see an Add Frames & More button you can click to select frame and matting options for your print. Learn more about these options here. Shopping from outside the United States? You can switch currencies using the drop-down menu on the top right of your cart. When everything is all set, click the "Begin Checkout" button or the "Check Out With Paypal" button.